Week 28 - GO CANADA GO! 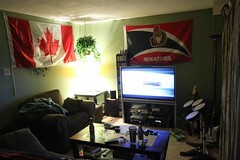 At the start of every hockey season, I get out the Ottawa Senators flag and hang it on the wall behind the TV. We have a large Ottawa Senators blanket that is folded in half and placed on the back of the couch, with "Ottawa Senators" facing outward. A small Stanley Cup is placed somewhere in the room. This year it happens to be on the CD rack beside the TV. This is all done with my wife's blessing. She's as much of a fan as I am. In fact, she may be a bigger fan because she knows all of the players' jersey numbers. Oh yeh, we also wear team jerseys while watching the game. For tonight’s Team Canada vs. Team U.S.A. Olympic game I got out the Canada flag and hung it on the wall in an attempt to bring some good mojo to the team. It didn't help. Maybe I was too late. 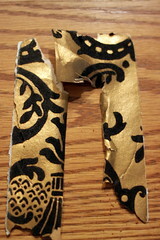 Anyway, thanks to the Olympics for my Week 28 Project 52 inspiration! Uh oh… it’s the cops! A little while ago, I wrote about all of the illegal left turns coming out of the Esso/Tim Horton’s at the corner of Ogilvie Rd and Montreal Rd. A day or so after, I actually sent the Ottawa Police an email about the issue. It took them a while, but they did respond saying that it was forwarded to the department(s) in charge. This afternoon I received an email from a constable asking for my name, address, phone number and birth date so he could follow-up on my “complaint”. I sent it to him. He called me this evening. He gave me a brief rundown of the history of the signage – how it started off as a single, waist-high sign at the Tim Horton’s drive-thru exit, and eventually became a larger sign, with an additional sign on the median. He acknowledged the fact that despite the multiple, clearly visible signs, many people are ignorant of them. He said one day when they were enforcing the signage, they gave out over FIFTY tickets, and he had to call for assistance because while he was issuing a ticket, someone else would make the same illegal left turn. Unreal. But based on what I see every morning, not too surprising. He thanked me for the update that it’s still occurring and said that they would likely be out enforcing it again in the near future. Like I said before, they could make some serious $$ in handing out fines. Anyway, it was cool that they followed up. I wasn’t expecting it since I don’t really consider what i sent to be a “complaint”, but more of an “FYI”. I replaced an old light fixture on the landing going to our basement and found this behind the base of the fixture. Obviously, when one of the previous owners removed the wallpaper, they took the quick'n'easy way out and didn't remove the light fixture. This week's photo comes from my trusty 'ol Canon S3 IS. 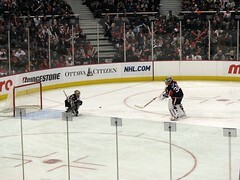 My family and I went to the Sens Super Skills competition this afternoon. Unfortunately, they frown heavily upon fans who use, or try to use, a DSLR camera. This is Brian Elliott take a fun shot on a junior goalie warming up. It's so cool to see pro players playing with the kids and treating them like an equal. Team Red beat Team Black this year, for the third year in a row.